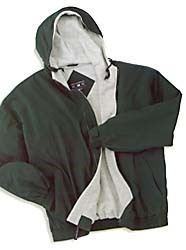 Water repellant shell, sweatshirt fleece lined body and pollyfilled sleeves for warmth, sleeve has nylon lining for easy on/off. 100% taslan nylon shell, 9 ounce poly cotton blend sweatshirt fleece lining, drawstring hood, inside storm flap, elastic cuffs with adjustable velcro tabs, inside zip pocket, lower slash pockets with zip closure, elastic waistband. Designed for casual day into evening wear, classic styling, water repellant and wind resistant to protect you from the elements, lightweight and packable, the ultimate value. 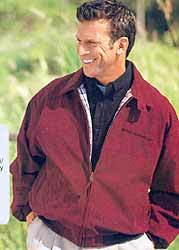 Poly cotton body lining, nylon sleeve lining, collar tab and buttons, rib knit cuffs and waistband, locker loop, lower slash pockets with snaps, inside chest pocket with zipper. Slip into this fleece-lined jacket and shrug off the cold. 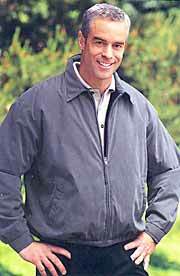 It has poly-filled, nylon-lined sleeves, a Velcro closure interior pocket, 2-button adjustable cuffs, and an elastic waistband for a perfect fit. 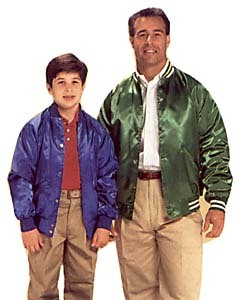 Microfiber fabric is water repellent, wind resistant and soft. 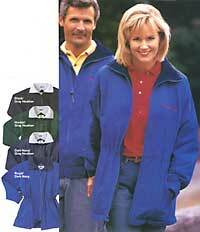 Micro Fleece lining is plush and very warm. 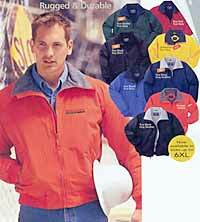 Durable water repellent Teklon nylon shell and poly-filled body with heavyweight fleece lining. 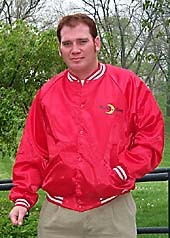 This jacket is a workhorse for everyone from XS-6XL, and tall sizes, too. Features include 1x1 rib knit trim at the waistband and cuffs for a snug, comfortable fit. Nylon lining in the sleeves makes this coat easy to pull on and off. Other features include lower slash pockets and one interior pocket, all with zip closures. Ribbed collar and cuffs with or without stripes, satin finish with lightweight Kasha lining-inexpensive enough to outfit the whole team.